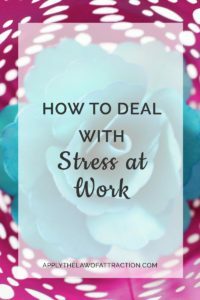 Some stress at work is normal, but too much stress can begin to take its toll on your physical and emotional health. You may find yourself working to the bone every day, only to have your boss gives you more work. He never seems to appreciate what you're doing. All you want is out. Your shoulders are so tense and the stress just keeps piling on. How can the Law of Attraction help you deal with stress at work? A lot of stress on the job is caused by expectations, usually your own. You expect your co-workers to pull their own weight, but they don’t and you’re left doing everything. You expect to only work 9-5, but you find yourself coming in early and staying late, just to get your work done. Not everyone will meet your expectations. But you won't always meet the expectations of everyone else either. You might not even meet your expectations of yourself. So allow it to be okay for your expectations to not be met. Yes, it would be great if they were always met, but it's okay if they aren't. Because your thoughts create your reality, if you focus on the things that bother you, you will only create more of them. By shifting your focus to how you want things to be, you begin to change the situation. So instead of getting upset or frustrated when your expectations aren't met, think about what you want to have happen – how you want the situation to be. If your stress at work is due to a person, you can use the following Law of Attraction technique. Begin by finding a place where you will be undisturbed. Think of the person causing you problems. See them as the kind of person who meets your expectations: someone who is honest, available, reliable, etc. Speak to them as if they are in the room with you. Speak from your heart as if they are already meeting your expectations. Feel what you are saying as if it were true. Tell them how grateful you are to work with them. Tell them everything that they do that meets your expectations and how well they do it. Thank them and yourself for changing your expectations. Change your thoughts about work and your stress will decrease. Keep applying these Law of Attraction techniques and before you know it, stress at work will be a thing of the past. I would take every opportunity i could to support your links. One more way I think I can show gratitude to RAISE my own vibration! Anyone that would have a problem with this needs your info all the more! Keep it up!